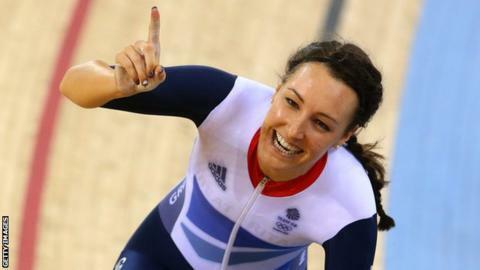 Great Britain's Olympic track champion Dani King received help from psychiatrist Dr Steve Peters as she attempted to get over a horror crash that left her fearing for her career. She was in intensive care for two days and in hospital for a further eight. "I've spoken to Steve Peters, who has helped me overcome the fear," the 24-year-old told BBC Radio Solent. King, who won gold in the team pursuit at London 2012, returns to cycling this weekend after five months out at the Tour of the Reservoir in Northumberland. Peters, who was a key factor in Britain's extraordinary track cycling success at the last two Olympic Games in Beijing and London, has also worked with Tour de France winners Sir Bradley Wiggins and Chris Froome. He has also been involved with England's football team, as well as world snooker champion Ronnie O'Sullivan. "I'm really looking forward to racing now - I feel really ready," added King. "I've come really far and to be honest I don't think it's much of a factor, I just need to get stuck in and get into it. It's time to put the accident behind me and just move on with the season. I don't want to dwell on it." King said Peters had encouraged her to view the crash as a "freak accident" and "not think about the possibility of crashing". Cardiff-based King, originally from Hampshire, decided in October to switch from track to road cycling to ride full-time for team Wiggle Honda. Has degrees in mathematics, medicine and medical education (Masters level). Also postgraduate qualifications in sports medicine, education & psychiatry. His book "The Chimp Paradox" explains how the human mind operates and how people can learn skills to manage their mind. Has helped sports stars including Ronnie O'Sullivan, Steven Gerrard, Craig Bellamy, Sir Bradley Wiggins, Sir Chris Hoy and Victoria Pendleton. Teams he has assisted include the GB Olympic cycling team, Team Sky, England's rugby union side and Liverpool FC. She was not named in the GB squad for the 2014-15 funding year, and believes she has a better chance of getting into shape for the track for the 2016 Olympics by spending a season on the road. "Ultimately it's about getting back into the team pursuit squad for Rio," she added. "Targets for the year are the women's tour, national road race and a couple of the tour series I'll also target. "It will be a case of proving myself at the track nationals and going into the World Cup season. That will be the key and where I'll be hoping to put some markers down."